I think I’m finally getting back to my regular posting schedule. I get the week between Christmas and New Year’s off of work which is letting me catch up on a few things. (Sort of. Life has still been rather hectic of late.) Last week I posted an in-depth review of one of Chromatic Press’ most recent paperbacks, Jessica Chavez’s debut novel Dead Endings, illustrated by Irene Flores. The novel has a fantastic combination of horror, mystery, and snark, making it both fun and frightening. I’m looking forward to reading its sequel a great deal. And because the end the 2015 is fast approaching, last week I also posted my annual list of notable manga, comics, and novels of the year. 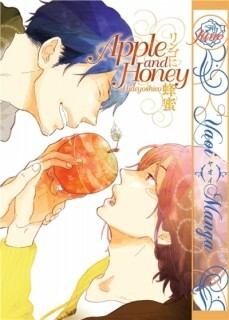 Apple and Honey / His Rose Colored Life by Hideyoshico. I wasn’t previously familiar with Hideyoshico’s work, but after reading the boys’ love collection Apple and Honey and its sequel/spinoff His Rose Colored Life, I sincerely hope that more is translated. In addition to the unrelated three-part story “Shades of Summer at the End of the World,” Apple and Honey introduces Natsuki and Komano who are the focus of His Rose Colored Life. Hideyoshico’s characterization is excellent—the characters have depth and the development of their relationships are entirely believable. Komano is this lovable outgoing goofball while Natsuki is much more reserved and unsure of himself. I was especially impressed by the sensitive portrayal of Natsuki’s anxieties and insecurities. While he desperately wants to be loved, he is also terrified of it, having been repeatedly hurt in the past; it’s hard for him to accept that it’s okay for him to be happy. (Natsuki also gets bonus points for majoring in information science which I hold a degree in but have never before seen in a manga.) Komano and Natsuki together make a wonderful couple, nicely balancing each other’s personalities. Lone Wolf and Cub, Omnibuses 3-5 (equivalent to Volumes 6-12) written by Kazuo Koike and illustrated by Goseki Kojima. The omnibuses are rather chunky, but I am so glad that Dark Horse is releasing Lone Wolf and Cub in a larger trim size; the previous edition was so small as to be nearly unreadable with my bad eyesight. Plus, it’s nice to be able to see Kojima’s excellent artwork more clearly. Lone Wolf and Cub is a fantastic series. Although there is an ongoing story to the manga, the individual chapters tend to be somewhat episodic. Ogami Itto was once the shogun’s official executioner but after being framed as a traitor he has become an assassin seeking revenge. Accompanying him on his journey is Diagoro, his now three-year-old son who has known nothing but a life filled with death. Lone Wolf and Cub is a violent series. Ogami is an incredibly skilled and resourceful warrior, surviving multiple attempts on his own life even as he is hired to end those of others. But he is also a father. Some of the most compelling chapters in the manga examine the depth of Daigoro and Ogami’s bond more closely. Milkyway Hitchhiking, Omnibus 2 (equivalent to Volumes 2-3) by Sirial. I’m not entirely certain, but I believe that with the second omnibus Milkyway Hitchhiking is complete. (Because the manhwa is a series of largely unrelated stories, it can be difficult to tell.) Whether or not it is actually finished, Milkyway Hitchhiking continues to be a beautiful series. The full-color artwork is gorgeous, Sirial changing art styles and color palettes to better suit the mood of each of the stories. The manhwa ranges from brightly colored, upbeat tales to those that are more somber and melancholy. Some are based in reality while others incorporate elements of horror, science fiction, or fantasy. The only thing that really ties the individual stories in Milkyway Hitchhiking together is the presence of the Milkyway, a space-time cat. Although she’s the titular character, Milkyway Hitchhiking isn’t necessarily about Milkyway herself. She frequently has an important role to play, however the focus of the series is much more on the stories of the people she encounters. Once again I wasn’t actually online much last week, but I did catch a few things that other people may be interested in: Over at Comics Forum, Martin de la Iglesia writes about Early manga translations in the West. Kate at Reverse Thieves explains How the Library Became My Go-to Place for Manga and Comics. (I posted a bit about finding manga at the library a little while back, too.) And on Twitter, manga scholar and translator Matt Thorn hints that a project with Moto Hagio is in the works. Let’s hope so! Honey Darling by Norikazu Akira. After reading and enjoying Beast & Feast I decided to track down more manga by Akira available in English. This led me to picking up Honey Darling. The manga isn’t the most realistic or believable, but it is cute, delightful, funny, and very sweet. Chihiro is a young man without any real goals in his life until he takes in a stray kitten. When Shiro falls ill, Chihiro ends up working as the live-in housekeeper for Kumazawa, the vet who treats her, and helping out in the animal clinic. Honey Darling has a lot going for it: nice art, a sense of humor, adorable cats and dogs, amusing and ttractive leads, likeable side characters (including women! ), and so on. Ultimately Honey Darling is a boys’ love manga, though. As might be expected, Chihiro and Kumazawa become more than just roommates by the time the manga ends, but the development feels more like Akira fulfilling a requirement of the genre rather than being something that was necessarily called for by story itself. Still, I did enjoy Honey Darling a great deal, the two of them made me happy as a couple, and the manga frequently made me smile. Lone Wolf and Cub, Omnibuses 1-2 (equivalent to Volumes 1-5) written by Kazuo Koike and illustrated by Goseki Kojima. One of the first manga to be translated into English, Lone Wolf and Cub wasn’t released in its entirety until Dark Horse picked up the license. Sadly, the first Dark Horse edition was tiny and, while extremely portable, was difficult to read because the text was so small and crowded. Additionally, those original twenty-eight volumes have steadily been going out of print. 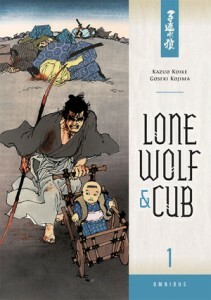 Thankfully, Dark Horse recently started releasing Lone Wolf and Cub in an omnibus format with a larger trim size. Though quite hefty (each omnibus is around 700 pages and collects about two and a half volumes or so), the reading experience is much improved overall. Lone Wolf and Cub is an excellent series, so I’m very glad that the manga will remain in print for a bit longer. The series is fairly episodic, following the titular Lone Wolf and Cub: Ogami Ittō, who once served as the Shogun’s executioner but who has become an assassin-for-hire out of revenge over the destruction of his family, and his young son Diagorō. Mail, Volumes 1-3 by Housui Yamazaki. Summer is the time for ghost stories in Japan, so I felt it was appropriate to finally get around to reading Mail. I came across this short series thanks to The Kurosagi Corpse Delivery Service which shares the same illustrator. Reiji Akiba–detective, exorcist, and the protagonist of Mail–actually briefly appears in the fourth volume of The Kurosagi Corpse Delivery Service as well. One of the things that particularly struck me about Mail is how often the stories incorporated modern technology such as cell phones and computers. It’s as though traditional ghost stories and urban legends have been updated for a contemporary audience. Occasionally Akiba will present a sort of prologue to the individual chapters, giving the stories an almost Twilight Zone feel to them. Mail can be legitimately creepy and at times a bit bloody, but gore is not at all the focus of the series. In general Mail is episodic, although the final volume adds a recurring character who becomes Akiba’s assistant as a sort of homage to Osamu Tezuka’s Black Jack. Stone Collector, Book 2 written by Kevin Han and illustrated by Zom-J. I want to like Stone Collector more than I actually do, but at this point I can’t really say that I’ve been enjoying the manhwa much at all. It’s not all bad. The artwork in particular has moments when it can be impressively dynamic. The character’s facial expressions are great. Even the basic premise of the story isn’t terrible. As a whole though, Stone Collector just isn’t working for me. Though it moves along quickly, the plot is thin and the characters are underdeveloped, almost as if it’s an outline or draft than a finished product. The second half of the second volume of Stone Collector of is devoted to a side story, “Land of Ice.” I was more interested in “Land of Ice” than the main story more because of its tundra setting than anything else, but it still frustrated me and had many of the same problems that Stone Collector proper has. November 2013 was the last time there was a Stone Collector update. I’m not sure if there are plans to release more (it may simply be that “more” doesn’t exist yet), but the story clearly hasn’t reached its conclusion yet. 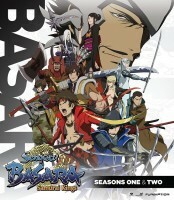 Sengoku Basara: Samurai Kings, Season 2 directed by Kazuya Nomura. While I was entertained by the first season of Sengoku Basara: Samurai Kings, I really enjoyed the second season. While there are still fantastically outrageous fights and action sequences, there’s also more focus on the characters and their characterization and on battle strategies and tactics. Personally, I appreciate the added context this gives the series. The characters, who continue to be magnificently and ridiculously overpowered, come across as a bit more human since their pasts and motivations are clearer. Their confrontations carry more emotional weight because of this as well. Miyamoto Musashi makes an appearance in this season, too. I was greatly amused by the fact that he fights with a giant oar. (Legend has it that Musashi once forgot to bring a sword with him to a duel and so carved a bokken out of the oar he used to get there; this why his weapon choice in Samurai Kings is simply perfect.) Samurai Kings is a tremendous amount of fun. Based on a video game that’s nominally based on actual events and historic figures, it’s wonderfully absurd and irreverent. MELINDA: Good morning, Michelle! It’s been a while since we met here, just the two of us. I miss it! MICHELLE: Me, too! I really enjoy talking about manga with you. MELINDA: So, with a whole slew of debut volumes to catch up on, we’ve decided to spend the next few columns on mutual reads only, so we can give these books the attention they deserve. Michelle, would you like to introduce our first selection for this week? 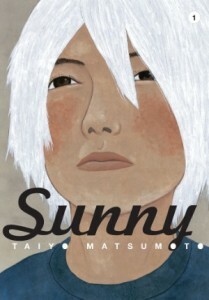 Sunny is the latest series by Taiyo Matsumoto (Tekkonkinkreet, GoGo Monster) to be released in North America. Serialized in Shogakukan’s IKKI magazine, Sunny is a slice-of-life story about kids living together in a group facility. Their circumstances vary—some might be orphans, but it seems that most have parents who are unable to care for them for some reason—but one thing they have in common is the use of an old, broken-down Nissan Sunny as a kind of playhouse. Junsuke is a snotty-nosed kid with a penchant for shiny things. Haruo is a white-haired boy whose play-time daydreams always involve being a cool, grown-up version of himself. Sei is the new kid, taciturn and utterly opposed to thinking of the facility as his new home. Episodic chapters ensue, and somehow Matsumoto uses quick, short scenes in such a way that the pace feels frenetic and leisurely at the same time. Hyper, but with that “we’ve got a few hours ’til dinnertime” quality, if that makes sense. MELINDA: Oh, what a wonderful way to describe the general feel of this book! The book’s structure and pacing seem so in tune with a child’s sense of time—that feeling of impatience on top of the endless landscape of imagination. These kids have more reasons than most to escape into their fantasy worlds, but they spend just as much time being shuffled along the familiar routines of childhood. Meals, school, sleep, play—their daily lives are similar to most young kids, but with an edge of anxiety most of us were privileged to do without. And it’s these points of anxiety that make Sunny feel moving and real, and not a nostalgia piece in the slightest. Some anxious moments that stood out for me were things like teenaged Megumu’s instinct to head for the nearby bridge when one of the home’s children goes missing, because being left to die in the river is actually her own worst fear, and young Junsuke’s desperate bouts of kleptomania. I was also very moved by Haruo’s fitful attchement to visiting adult Makio, the one person to whom he’s willing to confess that he dreads seeing his own mother because seeing her only makes not seeing her that much harder. Also, while the Sunny itself is certainly central to the story, somehow it’s the kids’ time spent out of the Sunny that shows us who they are even more than their stolen moments alone with their imaginations. That’s not what I would have expected, but Matusmoto is so deft at revealing his characters through their actions, everything they do feels significant. MICHELLE: There were so many things here that I loved. I love that Matsumoto depicts what it is that the kids are imagining, particularly Sei’s fantasy ride back to the place he considers his true home. I love the ridiculous song Junsuke makes up. I love the way Matsumoto’s art—not pretty but still oh-so-charming—delivers some poignant moments, like a subtle establishing shot showing the home as a place of warmth to go to when it gets dark (both literally and figuratively). I love that he never actually says “and this little kid is Junsuke’s brother,” but simply shows it through their physical similarity and interaction. And I love the whole bit at the end where said little kid, Shosuke, is intent on informing everyone he meets that he found some four-leaf clovers when, in fact, this is actually a lie. You know a manga is exceptional when even the presence of a dead kitty isn’t something that upsets me (because the kitty is treated with the utmost respect). MELINDA: The scene with Megumu, Haruo, and the kitty reminded me immediately of one of my favorite scenes from one of the later volumes of xxxHolic, in which Doumeki confides to Kohane that he’d decided to help Watanuki after having witnessed him standing alone in the rain, cradling a dead animal and wondering if he’d be left the same way one day. Yet as moving as the xxxHolic scene is, and as strongly as it affected me at the time, with Matsumoto’s straightforward storytelling in place of CLAMP’s self-conscious drama, I found that the scene in Sunny moved me more. MELINDA: I own no other works by Matsumoto, but I will soon. I felt the same way. MICHELLE: Luckily, Sunny isn’t a oneshot—it’s up to three volumes in Japan so far—so eventually there will be more. Speaking of renowned creators whose work we’d not read before, want to introduce our next selection? Moving swiftly from contemporary to classic, our second read this week was the first omnibus volume of Kazuo Koike and Goseki Kojima’s Lone Wolf and Cub, just released by Dark Horse Comics. Though this series first ran in Futabasha’s Weekly Manga Action in the early 1970s, and Dark Horse has been publishing its English-language editions since 2000, these new omnibus editions offer new readers a chance to experience Lone Wolf and Cub, and in a larger, easier-to-read format than Dark Horse’s original small-trim editions. This is a series I’d spotted many times in book stores and comic shops over the years, but never picked up, at least in part because of the small size. Now I feel rather silly about it, of course, because I’ve clearly been depriving myself! The book opens by introducing us to Ogami Itto, a master samurai now traveling as a ronin along with his toddler son, Daigoro, known collectively to most as “Lone Wolf and Cub.” The story’s structure is largely episodic, but though early chapters focus on tales of Itto’s fearlessness and skill (as well as his terrifying reputation across Edo-era Japan), we later discover that he took the “assassin’s road” as a last-ditch attempt to clear his family’s name after being wrongly ousted as the shogun’s executioner. In fact, one of the most oddly chilling scenes in this omnibus is one in which he leaves it to his infant son to decide whether he’ll join his mother in the afterlife or accompany his father on his blood-soaked journey, based on whether the son chooses to crawl towards a bouncy-ball or a knife. The series is action-packed and very compelling, filled with creative swordplay and expressive artwork that carefully depicts both the beauty and brutality of the era, but its greatest draw for me as a reader is Itto himself, whose sense of honor in combination with his unforgiving career path presents us with a protagonist as complicated and problematic as the era itself. In a modern series, I think a character like Itto would be written as a sort of “assassin with a heart of gold.” He’d be someone we could root for wholeheartedly even when he killed—a sort of Edo-era Mal Reynolds. But Koike and Kojima’s protagonist is no such thing. He’s reliable, trustworthy, and eminently honorable, but he always gets the job done, no matter who it is he’s been sent to kill; he could never be considered merciful, and only occasionally compassionate. He defends those he believes to be vulnerable or in the right, but only so long as it doesn’t interfere with his mission. And he’s utterly unapologetic at every turn, even when it comes to the plight of his son. I find him fascinating. MICHELLE: That would’ve been a great introduction even without the Firefly reference! At first, I was intimidated by the sheer size of the omnibus (over 700 pages! ), but found that Kojima-sensei’s artistic style boded well for quick reading. The panel layout is simple, but Kojima does especially well with establishing a sense of time and place, and I quite loved the establishing shots we get for each new location Itto finds himself. My only complaint about the art is that a lot of the clients and other characters look like. Sometimes I wasn’t sure if I was supposed to remember seeing anyone in particular before, but usually there are clues in the text that help to dispel confusion. Daigoro is the most endearing aspect of the story, as one might expect, but his presence for all these gory scenes is kind of disturbing. There’s one panel in particular in which he and his father are watching an opponent slowly topple, and once the guy finally goes down, Diagoro smiles. It made me wonder how warped he is gonna be! Of course, with all this bushido business, probably he’ll just be some hardened warrior who greets the concept of death casually. MELINDA: Heh, yes, there’s a chapter late in the volume that gives us the beginnings of a look at the man Diagoro might one day be, in which he fearlessly attacks much older characters with a look that one describes as, “eyes that see between life and death… the eyes of a swordsman able to place his heart in the nothingness of mu.” Later, Itto asks his son if he’s going to be able to reap what he’s sown, as Daigoro has thrown an entire household into deadly turmoil. Somehow, I imagine he’ll grow to be an even scarier adult than his father, assuming he lives that long. I, too, was intimidated by the length of this omnibus when I started, but I was stunned to find myself suddenly at the end, it read so easily. And it’s definitely worth the time! Most of my favorite stories were at the end of the volume. MICHELLE: Yeah, that part about Daigoro’s eyes was rather creepy. I can’t help but feel bad that he’s been shaped by witnessing all this slaughter, yet cannot deny the appeal of watching his dad dispatch his enemies with such skillful ease. I guess probably the mangaka wanted us to feel this way. MELINDA: Yes, I’m sure that’s the case. One of the things that I think makes this manga so interesting, is that its sense of morality is so clearly of another time and place. Often, modern storytellers will insert their own sensibilities into a period piece, either viewing it with rosy nostalgia or, perhaps, horror. But Koike and Kojima leave it entirely up to us to figure out how we feel about an era in which the value of a person’s life was viewed so differently than it would be today—and the value of death, for that matter. It can be hard to swallow at times, but it’s never sugar-coated. I’m really grateful for the opportunity to delve into this series at last! It’s certainly worthy of its classic status. MICHELLE: Well said! And I, too, am glad we decided to check this one out. As much as I love Takehiko Inoue, I actually enjoyed this more than Inoue’s Vagabond, and will probably keep reading it!